It’s never too late to create a plan to tackle your debt. Debt can be overwhelming and it can sometimes feel like you might never climb out of the financial hole. 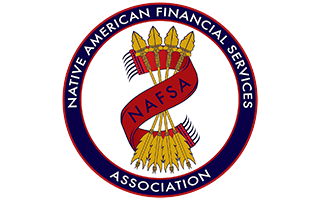 The Native American Financial Services Association’s (NAFSA) Financial Literacy Program provides free debt calculators to assist you in finding the best rate and interest payoff method. It also provides a free budgeting tool to help you manage your money in the future. There are two common methods of paying off debt, the avalanche method, and the snowball method. Using the avalanche method prioritizes any debts or loans with the highest interest rates to pay off first. The snowball method prioritizes the smallest debts first. The Debt Payoff module will allow you to input your loan details, including the remaining balance, the annual interest rate, and the minimum monthly payments. There is no limit to the number of loans you can enter, so be sure to add all your loans to get a more accurate picture. At the bottom, you also have the option to enter an additional monthly amount to pay towards your debt. Use this feature if you are choosing to budget more month to your loans to help pay them off. Once all your data is entered, the module will calculate how much time it will take to pay off your loan in years and your total amount paid. 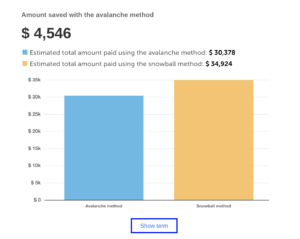 It will also show you the difference in the avalanche and snowball method. In the example pictured, the avalanche method would save the individual 1 year and 10 months and $4,546. Using NAFSA’s Debt Payoff module, you can gain a more in-depth picture of your loans and payment options. For more ways to take control of your finances, explore NAFSA’s Looking into the Future playlist with modules such as Estate Planning, Investments, and Retirement 101. Through their Financial Literacy Program, NAFSA provides financial literacy modules and tools with easy-to-understand information to help people better understand their finances and make more informed decisions.